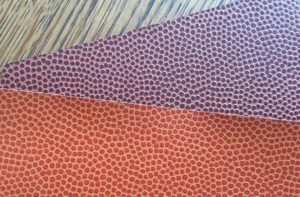 I shared with you recently how I created my own custom plaid patterns to match some flannel fabric I had purchased. I used the fabric to create table runners for a baby shower, which I turned into a baby quilt later. 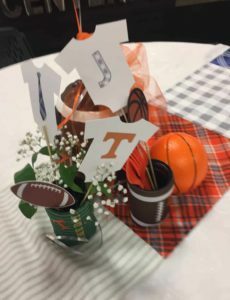 You may recall that the theme of the shower was sports, with an emphasis on Tennessee Volunteers. The couple are also really outdoorsy, so the flannel worked into that and we included natural elements as well. 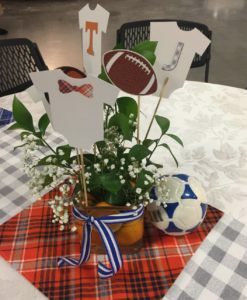 Today, I want to show you the rest of the decorations we used for the tables. For the base of the centerpieces, we used square glass vases filled with sliced oranges, greenery and baby’s breath. Then we tied some ribbon around each vase. Around the vases we scattered some balls from the dollar store. 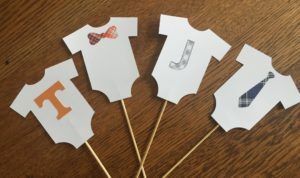 We created cardstock baby onesies and balls, attached them to wooden skewers, and used them as picks in the vases. If you aren’t in the habit of hitting up craft stores after a holiday or season when things go on sale, this will probably convince you. Since it was getting past fall, we found football pumpkins and koozies at 90% off. I’ll show you in a bit what we did with the koozies. We tied tulle ribbons and balloons onto the football pumpkins. (The pumpkins are hard to see in the photos. I didn’t focus on them too much because there’s no Silhouette stuff on them). Now, let me show you how I created some of those components. For these, I used a design from the Silhouette Design Store called Outfitting Baby by Echo Park. It’s design #74000. I used a white textured cardstock and made them 4 1/2″ tall. Bow ties and regular ties. These are print and cut stickers using the plaid pattern I created. They are both in a set called Four Ties by Lisa Norris (design #60469). The letter “J” for the baby’s name, Judah. On these I used a 3rd plaid pattern, also print and cut on sticker paper. Since a large part of this pattern is white, I used a black outline so the letter would stand out from the background. 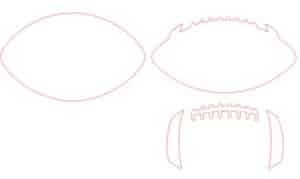 If you raise the line thickness and use Cut instead of Cut Edge, the blade cuts right down the center of the line. It’s an instant bleed — color that extends beyond the edge of the shape in case the cut is just a bit off. 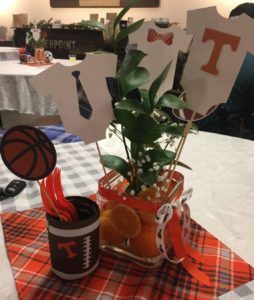 A Tennessee Vols logo “T,” which I cut from orange adhesive-backed cardstock. That means I didn’t have to glue each piece. This really saves times, particularly on small pieces. Since it’s 12″ wide and has it’s own adhesive backing, it’s also something you can cut without the mat. 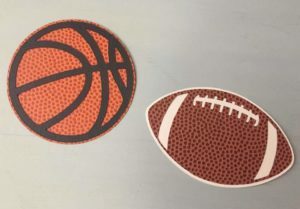 Back when my son was in high school, I discovered some really cool papers with a football and basketball texture. They make shapes you cut out of them way cuter than plain paper. I believe I’ve found these both at JoAnns and Hobby Lobby. Textured cardstock like this can be challenging to cut, since the surface is uneven. I usually cut from the back side and do 2 passes. And of course I ALWAYS check the cut before I unload. You could also do your own embossing with a Curio. Or, use an embossing pen and clear embossing ink to add dots to regular cardstock for a similar effect. I used a basketball shape by Silhouette — #1352. For that, I cut the circle from the basketball-textured paper and the lines from black adhesive cardstock. For the football, I used one by Lisa Norris — #65242. I eliminated the piece on the upper right. Then I created an offset of the one at the upper left. I took the original upper left one, the stripes and laces on the lower right, aligned them and made them all a compound path. That’s what I cut out of the football paper. (I realized after cutting that I should have made the stripes and laces a bit smaller before creating the compound path, as I ended up with really thin sections where the stripes meet the outer edge of the ball.) Because I made the compound path, it’s easier to see the final product. Basically, the stripes and laces are holes in the ball shape. The offset I cut from the same white textured cardstock I used for the baby onesies. Since you can see through the football paper to the offset piece, you get the white you have on a football. 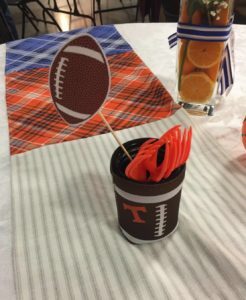 We used the koozies on the tables to hold silverware, sliding a plastic cup inside to hold the form. The koozies came with a football degisn on some, a football field on others. I used scraps of orange HTV to add the “T” to those. We stuck some of the picks in these also. It’s a small thing, but lots of little things add up to a completely custom baby shower. I want to show you one more thing we made as a decoration for the food table, but that’s a story for another day. Note: This post may contain affiliate links. That means if you click the link and purchase something, I may receive a small commission. This helps me to be able to keep my business going and provide more tutorials. All opinions expressed are my own and are not tied to any compensation.